Karen K. Dickmann, 54, of N Wisconsin Street, Port Washington died Wednesday, March 2, 2005 at Aurora Psychiatric Hospital in Wauwatosa, Wisconsin. She was born March 8, 1950 in Port Washington to Edward and Sylvia Majerus Dickmann. A graduate of Port Washington High School Karen worked in Environmental Housekeeping at the former St. Alphonsus Hospital and currently at Columbia St. Mary’s Hospital – Ozaukee Campus. She also volunteered at Heritage Rehabilitation and Nursing Home in Port Washington. 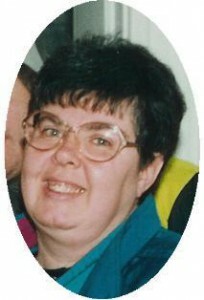 She was a member of the St. Mary’s Christian Women, enjoyed reading, walking and cooking shows. She is survived by her son Michael Mattson, Jr of Mauston, her mother Sylvia of Port Washington, brothers Ken (Paula) Dickmann and their children Patty and Jack of St. Paul, Minnesota and Dale Dickmann of Milwaukee and a sister Donna Dickmann of Port Washington. Her father Edward preceded her in death. Mass of Christian Burial will be celebrated by Reverend Allan Sommer at 1 pm Saturday, March 5, 2005 at St. Mary’s Catholic Church. Visitation after 11:30 am Saturday at church (430 N Johnson Street). Cremation with final interment in St. Mary’s Cemetery. Memorials to St. Mary’s Church or charity of Choice appreciated.